WEBZEN, a global developer and publisher of free-to-play games, launched its 6th anniversary game events today, celebrating 6 years of its global game portal ‘WEBZEN.com’. Since 2009, WEBZEN.com has brought free-to-play online games to players worldwide. 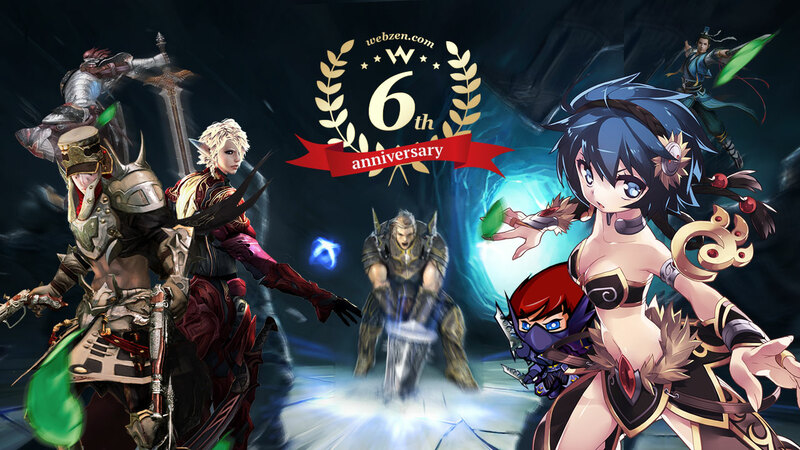 Celebrating its 6th anniversary, WEBZEN has expanded its service to Europe, North and South America, and other countries by operating its global game portal WEBZEN.com with 50 million players from all over the world. To celebrate the 6th anniversary, WEBZEN is hosting the following in-game events: starting off with a bang, you can boost a character’s level for free, gain more loot and gold, enjoy an EXP boost, reap the benefits of daily login rewards, and much more for WEBZEN games, including RAPPELZ, FLYFF, CONTINENT OF THE NINTH SEAL (C9), MU ONLINE, ARCHLORD 2, SEVENCORE, and AGE OF WULIN. Full details are now available on the official website: http://www.webzen.com/anniversary/6/events. In addition to in-game events, the WEBZEN team has just launched a free item pack giveaway event for all players to enjoy. From today through to 30th April, 2015 (UTC), players can visit any of WEBZEN’s media partners to obtain a special free item code. Players must choose only one from your favourite WEBZEN.com games, and each code will give you a free item pack for your game. A code is limited to only one WEBZEN game, including CONTINENT OF THE NINTH SEAL (C9), RAPPELZ, FLYFF, MU ONLINE, ARCHLORD 2, and SEVENCORE. Keep an eye on our giveaway page for further details later today. Along with this 6th anniversary, MU Online launched its latest expansion today, Season X Part 1 & 2, bringing out a brand new female class, “Grow Lancer”, new Asgard server, increased level cap of 770, new event maps, and more. Watch more of Season X Part 1 & 2 on Twitch.tv channel: http://www.twitch.tv/webzen_mu/profile. Moreover, German/French language servers for free-to-play mounted combat MMORPG SEVENCORE will be available after the scheduled maintenance on Tuesday, the 7th of April (UTC). More information about WEBZEN.com’s 6th anniversary events is available on the official website: http://www.webzen.com.